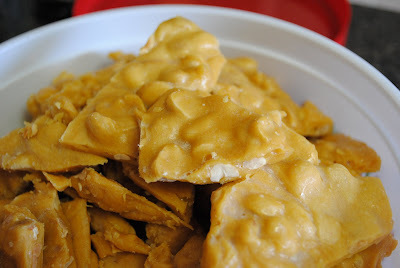 Peanut brittle is an old-fashioned holiday classic. It seems like everyone's grandfather loves the stuff. I made some a couple of years ago in the microwave actually but this time I decided to try a stove top recipe. Be careful not to burn yourself, 300 degree boiling sugar is dangerous! I made a couple substitutions to the recipe, but not necessarily on purpose so I'm going to give you the original and my changes. Spray a heavy cookie sheet lightly with cooking spray and set aside. Set out all of your supplies, measuring out your vanilla and combining baking soda and salt. You'll want to have everything ready to go because the final steps happen very quickly once you reach the correct temperature. Also, make sure you use a large enough sauce pan as the mixture will bubble up once you add the baking soda. 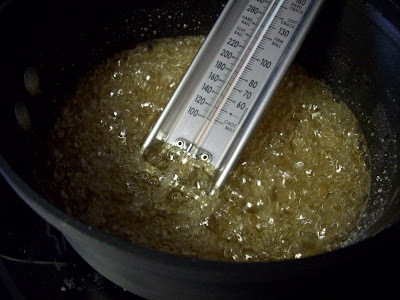 Combine sugar and corn syrup in saucepan and cook over medium high heat until boiling. Cover the pan for 3 minutes to prevent sugar crystals from forming. Remove the cover, attach candy thermometer and continue cooking, stirring occasionally until the temperature reaches 320 degrees, about 15 minutes. Remove from heat and stir in peanuts and baking soda and salt. The mixture will foam and bubble, continue stirring until it starts to calm and then add vanilla and butter. Stir quickly until butter is melted. You will have to work quickly as the candy will start to harden immediately. Pour the mixture onto prepared pan and spread out as thinly as possible. 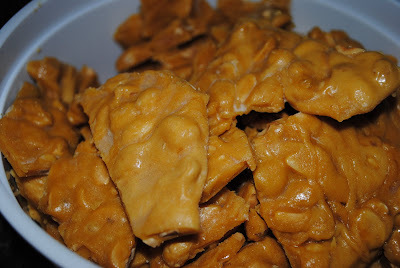 Let the brittle cool for about 2 hours to room temperature and then break into pieces. This was one of my favorites from Christmas baking this year! Glad you liked it! I don NOT recommend making this if you plan on giving it as a gift. This took 3 tries, 2.5 hours and a lot of anger. not particularily great for the xmas spirit. it tastes good, but looks like crap. impossible to incorporate butter, nearly impossible to spread. i don't even know why it calls for butter, i sopped most of it up with paper towel. total disappointment. thanks for reading my rant while i go cry in the corner. @Wendy -- sorry you had such a bad experience. I didn't find the recipe difficult at all but if you read my modifications above, you'll see that I only used 1/2 the amount of butter called for - by accident actually but it worked out well. 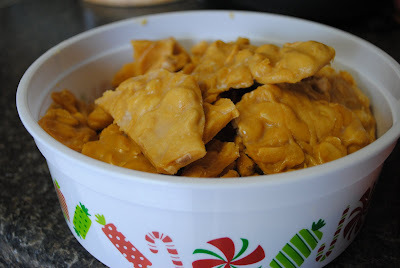 Merry Christmas and I hope you have better luck if you ever attempt a brittle recipe again!